This is the last (to date) of Lynda La Plante’s Anna Travis books. Throughout the series Travis has progressed in her career to become DCI Travis, (Detective Chief Inspector) under the mentorship of James Langton, with whom she has a complex and sometimes turbulent relationship. Wrongful Death begins with a case expected to go nowhere. Officially ruled to be a suicide, the death of businessman Josh Reynolds takes on unforseen consequences when that ruling is questioned – initially for reasons of bureaucracy (because there are no current legitimate murders to be investigated, and a case is needed to justify allocation of resources to a newly equipped office). The investigation is both helped and hindered by the arrival of a visiting senior FBI agent, Jesse Dewar, whose methods and lack of restraint cause friction within the investigating team. Links with the FBI are increased when Langton and Travis are sent to the US to train and liaise with the American agency, and the differing methods and attitudes of US and British law enforcement are contrasted. I’m not really sure why the story needed the FBI involvement, apart from the sense I got that La Plante wanted to show the superiority of the British police over the US agency. The American on British soil is brash, impulsive and her tendency to jump to conclusions is a danger to the investigation – even through she’s able to bring important information to light, she would easily undermine everything if not for the restraint enforced by her British colleagues. Likewise in America, Travis is able to quickly solve a cold case within days of her arrival that had stumped the FBI for a couple of years. La Plante also takes aim (pardon the pun) at American law enforcement’s reliance on firearms; resolving crimes with fire power instead of slapping on the handcuffs and telling a suspect they are “nicked”, a result Langton says he prefers. Despite the story’s diversions, this book is just as readable as the others in the series, and kept me guessing a little more than some of the others. Some of La Plante’s work leaves few questions about the identity of a perpetrator. Instead of being who-dunnits, they focus on having to prove the guilt of the only viable suspect. Wrongful Death is a little different in having variety of plausible suspects for a crime that may not actually have been committed. An important part of the Travis books takes place within the interview rooms with Travis and/or Langton questioning suspects, and usually after a little cat and mouse interplay, bringing about the result they want. This book continues with that direction, but IF there’s really a crime to solve, could they have met their match with a perpetrator capable of creating such uncertainty? This might be the last Anna Travis book. It is now 5 years since it was published and since then La Plante has returned to writing Jane Tennison stories, turning the clock back to Tennison’s early days as a WPC. If Travis does return, the conclusion of Wrongful Death requires that the story dynamics be significantly different in the future. But if there are no more books, the series has ended with a satisfactory sense of closure. The flood of Moslem refugees across Europe was constantly in the news two or three years ago, and most books I’ve recently seen about refugees have been about those escaping from Syria. I thought this would be the same, but instead the story dates back to the late 1970s, early 80s and the Iranian Revolution. Annahita Parsan’s abusive husband Asghar found himself on the wrong side of the new Islamic government in Iran after the Ayatollah Khomeini deposed the Shah of Iran. Together they escaped Iran via Turkey, where they were imprisoned and brutally treated. Eventually they were freed and allowed to move on to Denmark as refugees. Despite the potential for a new life, Asghar’s violence against his wife increased in frequency and intensity and there seemed to be no escape for her. But a seed was sown when visitors to her door gave Annahita a bible in Farsi. Ever since I had been given the Farsi Bible, I had picked it up and prayed from time to time. The worse Asghar’s attacks had gotten, the more I had prayed. I found that it helped, much like drinking a glass of cool water took away the dryness in my mouth on a hot night. She started to become aware of ideas about God that were different to what she had “learned in a mosque”. There it was all about fear and rules and the difficulty of earning a route to paradise. I had never thought of God being interested in helping me, let alone being with me all the time. I liked the idea. It gave me courage. In time that courage helped her to take steps towards freedom for herself and her children. Freedom from the violence of her husband and towards the freedom of a new life of faith. Annahita Parsan now works within churches in Sweden, ministering to former Muslim refugees. Keep the Home Fires Burning (World War II Stories from Swadlincote and Surrounding Areas), edited by Jen Edgar. For several months I had this book on a wish list with a second hand book dealer, before I finally decided it was time to buy it. I’ve long wanted to find out more about the wartime history of my family home-village, Newhall, where I spent my childhood. Swadlincote is the nearest town, and by the time I lived there, village and town had more or less merged into each other. Located at the southern tip of Derbyshire, Swadlincote is close to the borders of Staffordshire and Leicestershire and was developed around the presence of coal and clay. My family had lived in this area for generations until we moved to Australia in 1971. I’ve heard a few war time anecdotes from my parents, and I’ve been interesting in finding out more of that war time history beyond those family stories. Disappointingly this book didn’t provide what I’d been hoping for. Based on personal interviews of residents of the area, the book has been compiled as a collection of memories that haven’t been given any context. They remain as separate, unrelated accounts that could relate to anywhere instead of having any particular local relevance. For me the most significant aspect of the book was the involvement of students from my former school (William Allitt School, Newhall) in the interviewing process. Almost two years ago I reached 300 books on my “Books Read” list. A list I started late in 2009. I wanted to mark that milestone with a “worthy” title, and chose Schindler’s Ark , a book of recognised literary merit (Booker prize winner), addressing something of significant historically importance (the Holocaust). I have now reached book number 400, and chose a different kind of book about people and events a lot closer to home. As a Christian and a painter, I took a personal interest in the events explored in this 400th book. Reading The Pastor and the Painter was a little like reading a book about the Titanic. The tragic conclusion has already been well publicised. However, the important part of this story is what happens before that conclusion: a story of crime, politics, redemption and the victory of finding faith in God. 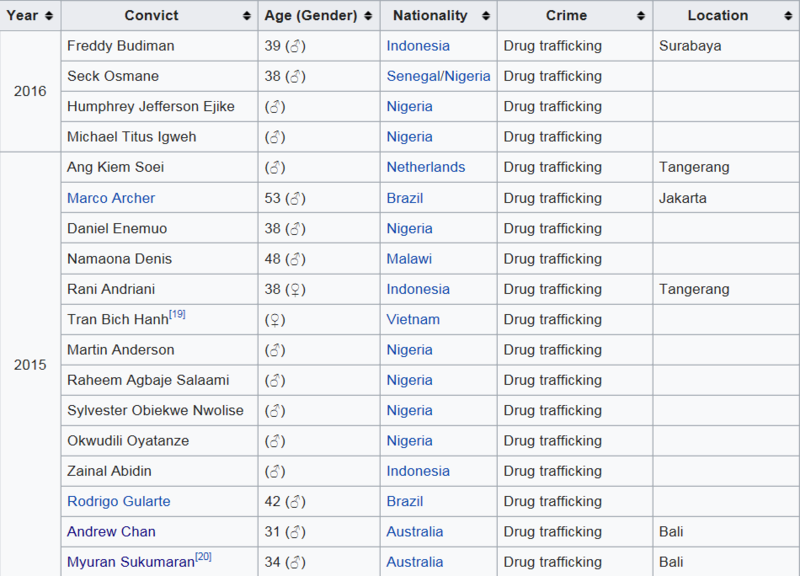 Andrew Chan (the pastor) and Myuran Sukumaran (the painter) were killed by an Indonesian firing squad, upon the order of the Indonesian president, Joko Widodo. Chan and Sukumaran as accused leaders of the “Bali Nine”, had been sentenced to death by a Bali court for drug trafficking a decade before the sentence was finally carried out. Pleas for clemency were denied. As a journalist, Cindy Wockner reported on the Bali Nine case from the beginning and was able to spend a lot of time with the nine Australians imprisoned for trying to smuggle drugs out of Bali to Australia. She developed a friendship with Chan and Sukumaran and had frequent access to them to report on their plight as they fought and lost their fight to avoid execution. Her book was written to continue their fight, obviously not for themselves, but for others who remain on death row in Indonesia. Not long before his death, Sukumaran painted a portrait of the man who would demand that the executions be carried out. On the back of the painting of the president, Sukumaran wrote “People Do Change”, stating the fact that everyone apart from the president seemed to recognise – that the two men whose lives were being taken from them were not the same men who committed the crime a decade before. They HAD changed. The men sentenced were young, irresponsible, angry, unco-operative and undeniably guilty of the crime. The men being executed 10 years later were repentant, responsible and highly respected by those with authority over them in jail. Unlike many in their position who buried their despair in drug use, Chan and Sukumaran turned their lives around and went to work developing and running training programs and various other activities for other prisoners within the jail. Chan studied for Christian ministry and started a church within the prison. Sukumaran developed his artistic skills and was mentored by Australian artist Ben Quilty; sharing what he learned through holding art classes for fellow prisoners. Paintings were sold and proceeds used for various causes, including raising money to pay for life saving surgery for a female prisoner. While many in the past have had sentences reduced, sadly, for others Indonesian law would remain inflexible. Laws are like spider webs: if a fly or mosquito gets near, it gets trapped, but if a wasp or bee goes near, it breaks it and leaves. The same applies to the law: if a poor man strays he gets caught, while the rich and powerful exempt themselves from the law and walk away. The absurdity of executing fully rehabilitated young men, who had not only turned their own lives around but had made significant contributions to the rehabilitation of their fellow prisoners, became even more extreme when the time came for them to be transported to the place where they were to be held prior to facing a firing squad. It was a full-on military exercise with armoured vehicles, armed soldiers and fighter jets escorting them on their journey. On 27th April, two days before he and Myuran were executed, Andrew Chan married Febyanti Herewila, a local church minister he’d known and loved for some time, in a small ceremony within the prison. All up, about 20 people gathered, After Muran led them in prayer, he started singing ‘Bless the Lord’, a song also known as ‘10,000 Reasons’, and one they all knew and loved. There was still some time for jokes amid the sad pall that hung over the Besi prison visiting area. As Myuran got stuck into some more junk food, someone told him it wasn’t good for him. He smiled. “There are worse ways to die”. On 29th April 2105, at 12.25am, Andrew and Myuran and six others were brutally killed by Indonesian president Joko Widodo. The weapon used: firing squad. They were strapped by the elbows to wooden crosses and sang until their voices were silenced by almost 100 simultaneous gunshots*. The song in the video above is the one cut short by the fatal bullets. * There were 12 marksman assigned to each victim, firing a combination of blanks and live ammunition.